Roberto Brandoni was born in the town of Castelfidardo in Italy - the heart of the musical instrument industry in that Country. At the age of six he was helping out in his uncle's accordion factory and recalls sleeping under a workbench when exhausted by his labours as an embryonic instrument maker. 35 years ago he settled in England and has been actively involved in the UK music industry ever since; initially working on accordions, reed organs and Fender guitars for distributors Dallas-Arbiter. He graduated to establishing his own Company, operating in a variety of fields; supplying cables, cases and other music related accessories. These days his main area of business is centred on the very successful range of QUIK-LOK guitar, rack and keyboard stands. Roberto's involvement with guitars really started when he purchased stocks of Vox and Hayman spare parts and set up workshops in Wembley. Here he produced and customised some fine instruments over the years including the Graffiti of London range. 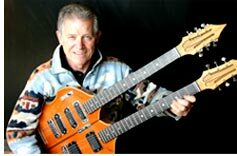 On a trip to Italy he discovered a quantity of Vox Peardrop and Phantom electric 12 string guitars with original cases in pristine condition, untouched for 25 years. These proved to be very popular when brought to Britain and can often be seen gracing television music programmes and videos. These Eko made instruments offered true retro-style with performance much improved on the earlier UK made Voxes. Eko, the largest guitar manufacturer in Europe had in fact closed down and in 1987 Roberto acquired the entire inventory of remaining stock. Although known mainly in the UK as purveyors of low to mid-priced instruments, the Company was capable of producing some excellent products using the best woods, matched by excellent building skills. Roberto is quick to point out that Eko always maintained large stocks of well-seasoned timber; only using wood that had been stored for at least 15-20 years. The copious quantities of necks in stock at Wembley are therefore now over 40 years old and the fact that they are still in fine shape is sufficient testament to Eko longevity. Such an advanced age also guarantees an 'instant vintage' status for anything built in the 2000's utilising these components; an intriguing and surely unique plus point. The contents of the Welson factory, another leading brand on the Italian guitar scene were purchased and by the middle of the decade an increasing number of Brandoni Custom instruments appeared on the market. Guitars have been produced for many leading players including Brian May, The Cure, Coldplay, the Bryan Adams Band, Pepe Rabone and Chris Difford of Squeeze; a thriving mail-order business has developed in recent years.